Properties in Bab Doukkala Mosque average 4.5 out of 5 stars. 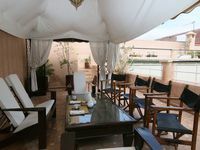 Property 25: Villa to rent 29 Apple Gardens, Rue de Fes, Marrakech. Property 40: Traditional house of charm any comfort with swimming pool without vis-à-vis. Property 47: Villa Marrakech for 10 people with large pool, stove and internet.